Being distracted by a cell phone while driving can lead to dangerous scenarios. 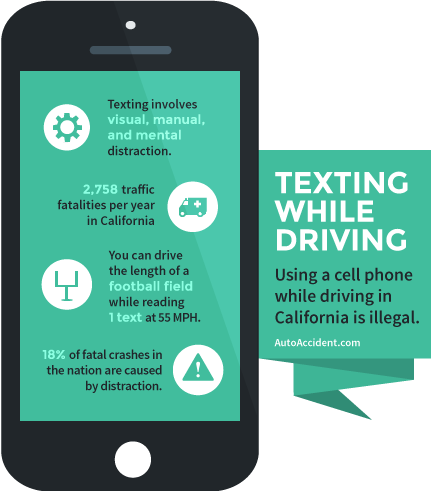 This has led California to implement a distracted driving law, which bans drivers from using handheld cell phones, with certain exceptions. These include making emergency calls and for those who are driving emergency vehicles. If you have been injured by someone who was texting and driving in California, feel free to reach out to me about the state's distracted driving law. I am Ed Smith, one of the highest rated auto accident personal injury attorneys in California with over 3 decades of experience. In this article, we'll talk about California's law on distracted driving. Reading text messages on a cell phone while driving involves visual, manual, and mental distraction. You can cover the length of a football field while reading a text. (A vehicle going 55 MPH covers just over 80 feet per second. 80 feet times 4.6 seconds equals 368 feet. A football field is 360 feet). Even though texting and driving is illegal in California, it is still a common occurrence. The penalties are not very high, and unfortunately, many young drivers believe they can text and drive with no problem. The problem is it only takes once to change someone's life in a devastating way. In the last 30+ years, I have seen several different types of injuries including cervical sprains. If you have been injured feel free to contact me for a free consultation. I can be reached at 916.921.6400 or (800) 404-5400 I work in Sacramento and cover injuries all over the state. If someone else is better suited for your case I can refer you to one of the many attorneys that I have a relationship with. I also have put together a huge Q&A related to auto injuries here: Auto Accident FAQs.